The Palomar has been having a moment ever since it opened its doors last June, to dish up the food of modern-day Jerusalem in a quiet street off Chinatown. A little over a year later, the buzz only seems to have grown louder. 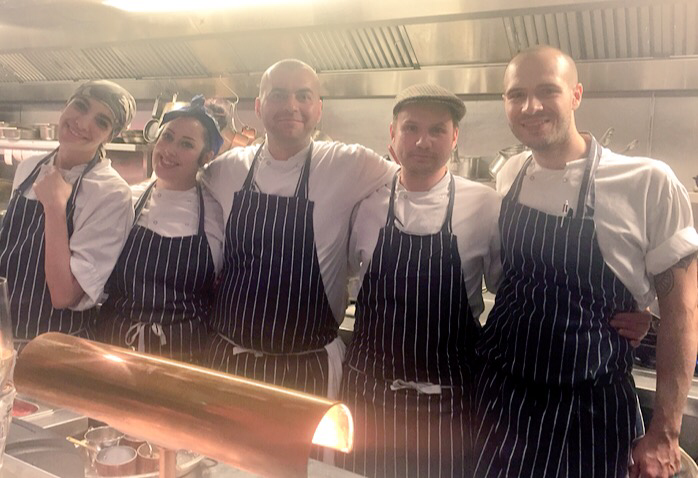 Palomar recently won the best restaurant category in GQ Food & Drink Awards, while Tatler named it restaurant of the year. Yep, that likely means that it’s become that much more tedious to make a reservation. But the thing is, I’ve been craving their Jerusalem-style polenta for days now, having had a delicious taste at Taste of London a couple of months back. And so I – successfully – tried my luck with a walk-in relatively early on a weekday. In Palomar’s case, reservations are overrated anyways, as they can only bag you a table in the tiny dining room at the back. 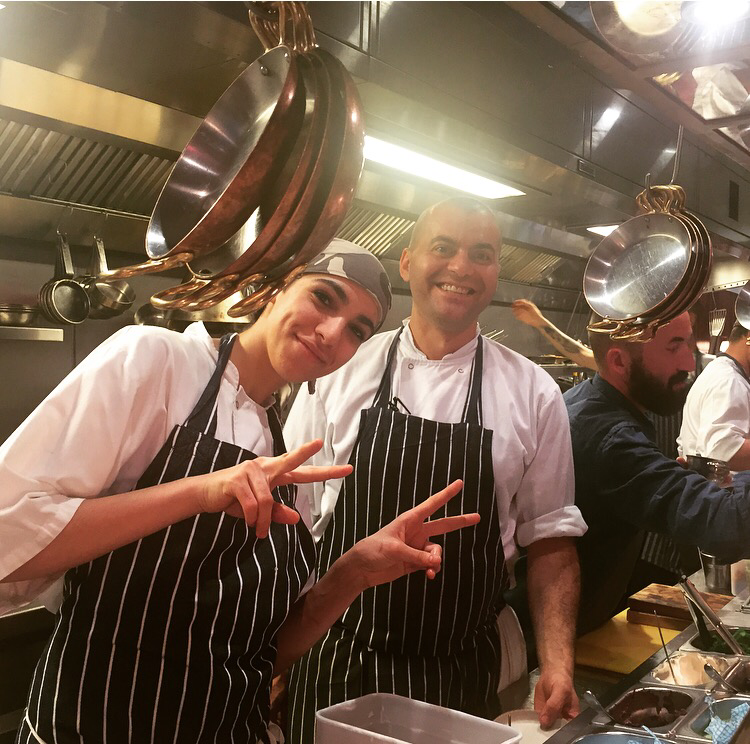 It’s far more entertaining to be seated at the zinc-topped kitchen bar, looking into the open kitchen to see the friendly master chefs at work… and at play! The atmosphere is loud and jovial, charged and laid back all at once, with just the right level of theatrics. It’s fabulously fun. My bestie Megs and I settled in right away, kicking back with a tipple. 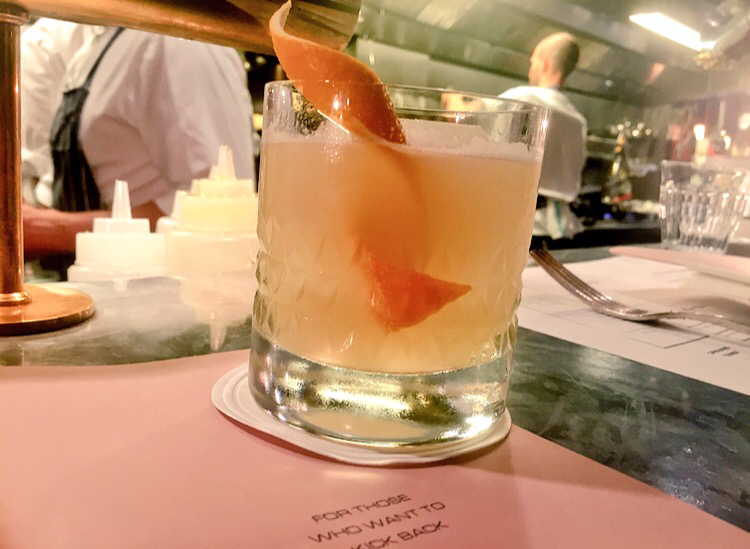 A Bumblebee for me, a soothing concoction of gin, lemon juice, honey and ginger syrup, dry Curacao and orange bitters. It was surprisingly strong and definitely fortifying – just what was needed to make Monday better. There’s a lot to comfort in the food too, with a dreamy menu that reads like a cultural melting pot, absorbing influences from all over, Mediterranean to North Africa and the Levant. 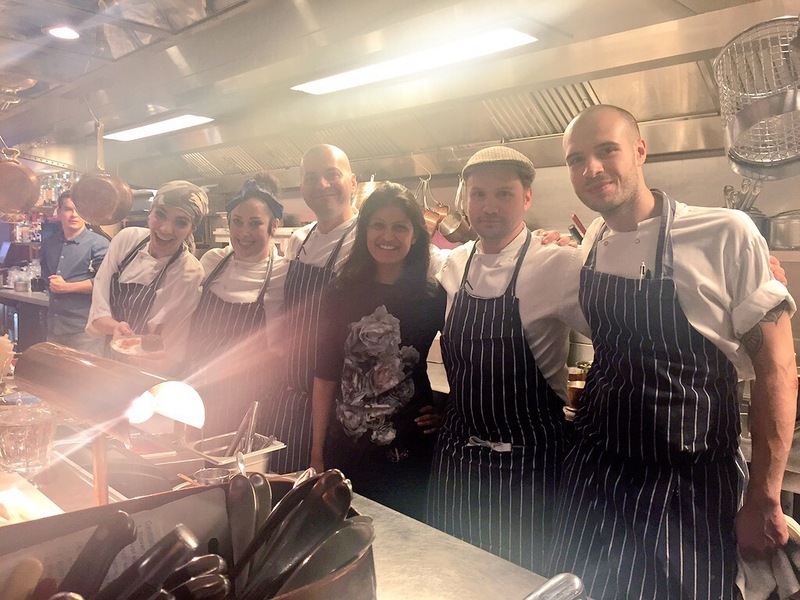 I had the pleasure of speaking with head chef Tomer Amedi back at Taste of London and as he simply put it: “comfort (food) is comfort (food)”, whichever cuisine you take. Of Kurdish-Moroccan heritage, Tomer has a profound respect for diverse cultural traditions, which married with his love for cooking yields an eclectic culinary approach, opening up a world of herbs and spices. The result is phenomenal, a smörgåsbord of bold and intense flavours. 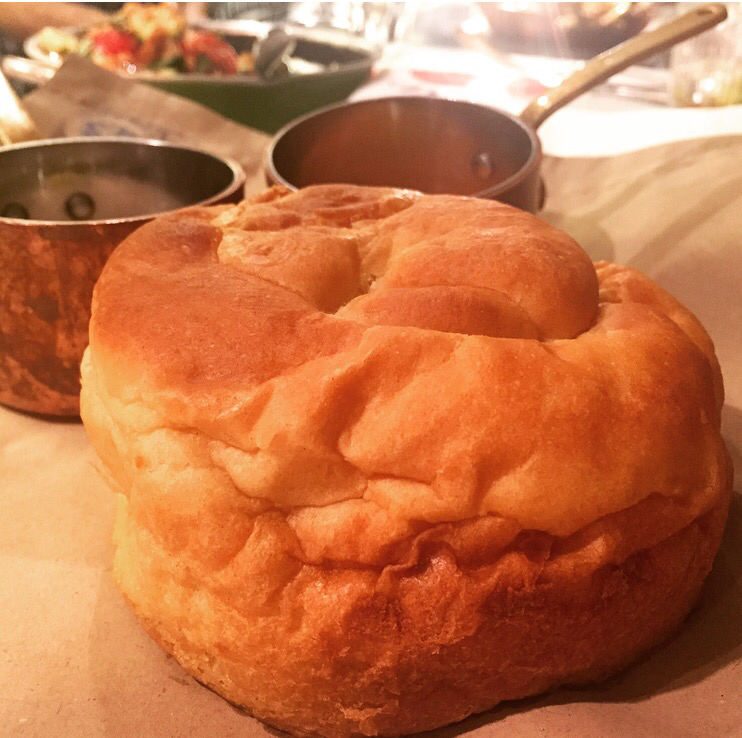 Kubaneh, to start with – warm and fluffy Yemeni pot-baked bread, meant for dunking into the nutty tahini and tangy tomato dips served on the side. It’s worth going slow with this one, so you can use it also, to mop up the tasty excesses of sauces that the mains later arrive swimming in a pool of. Next up, salad. 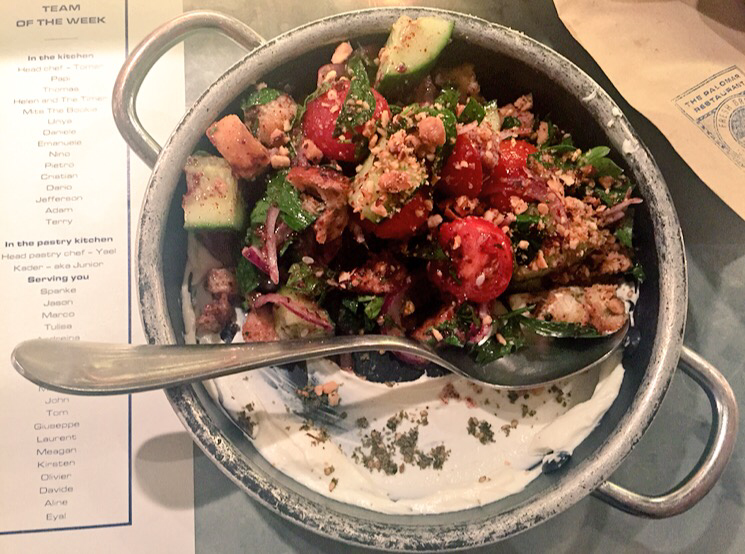 With a bevy of Lebanese restaurants in my ‘hood, I’ve had a fair share of fattoush over the years, which I could sum up as just mixed greens, chopped tomatoes, cucumbers and toasted pita tossed around in a ton of olive oil. Palomar’s rendition is quite something else. Perhaps it’s the tartness of the sumac used or of the creamy smear of labneh (a yogurt cheese), or it could be the herby undertones of the za’atar. Likely, it ‘s a combination of all of the above that makes for a very vibrant salad, with a delicious crunch added from the generous sprinkling of brazil nuts, alongside the pita croutons. 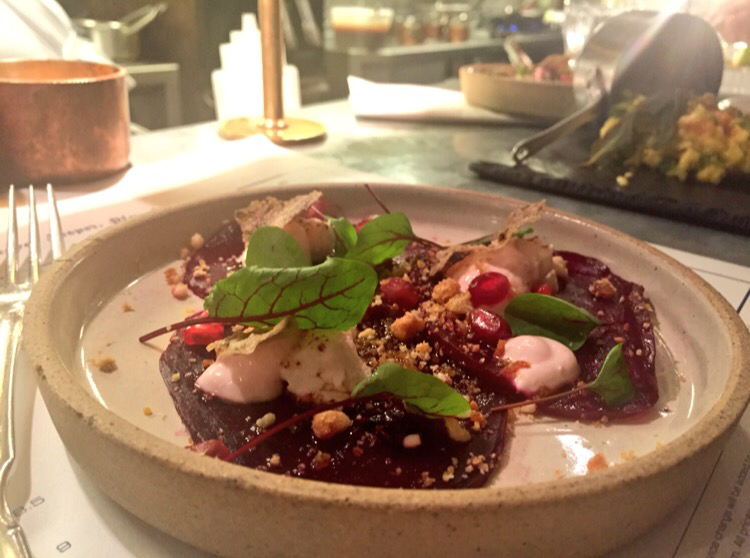 Sent over by chef Thomas, the Beetroot Carpaccio was a welcome surprise, beautifully textured with little dollops of burnt goats cheese on beetroot, drizzled with hazelnuts and a date and honey syrup, for a touch more sweetness. 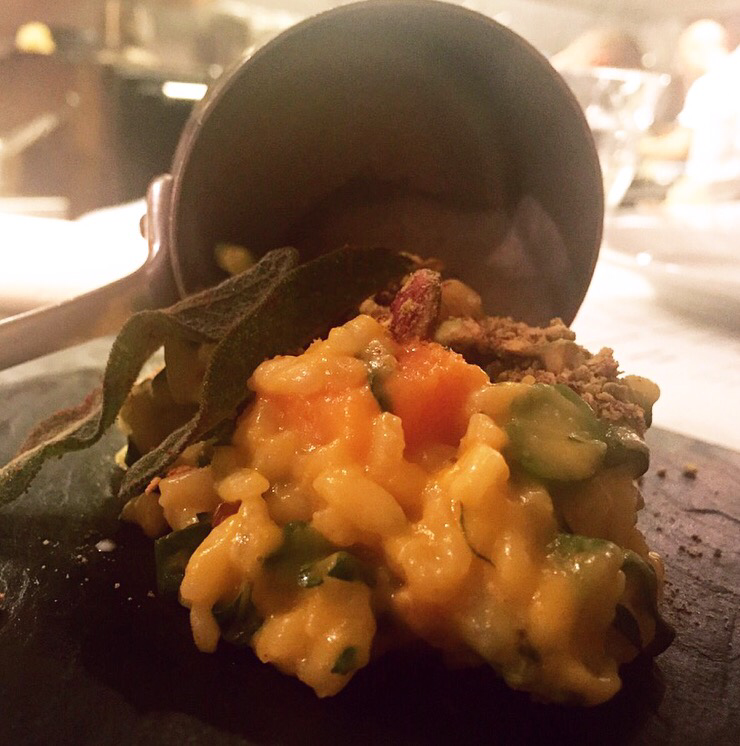 The butternut squash risotto was another gift. Presented artfully spilling out of an upturned saucepan, the flavours run rampant in this dish too, served with mangetout, pine nuts and a creative parmesan labneh foam. Don’t be put off by the portion size – looks are deceiving. Made with double cream, this is an incredibly rich dish, that is complemented by a subtle hint of rosemary. The cauliflower “steak” seriously impresses, with a delicate seasoning that neither under- or over-whelms. It’s just perfect. 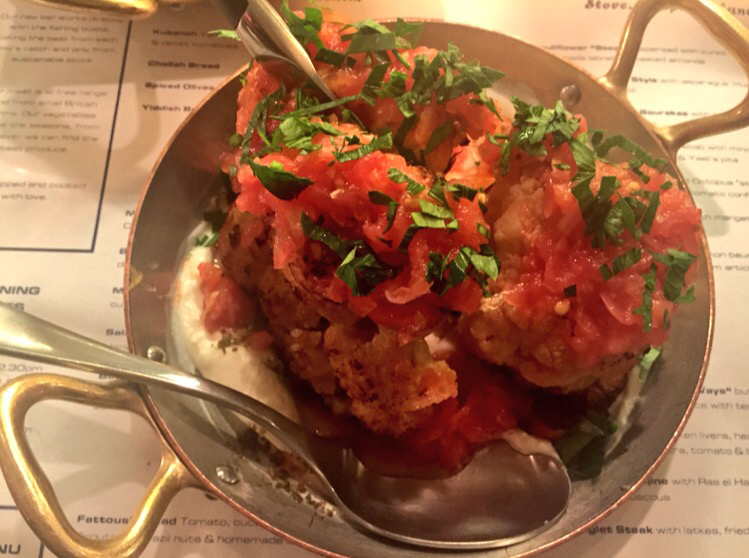 Cooked in the josper over, until soft, the cauliflower is served in almost its entirety, coated with lemon butter and sitting lightly on a bed of the housemade labneh with toasted almonds on top. Finally, the main event – polenta “Jerusalem-style” for comfort food with a decadent twist. 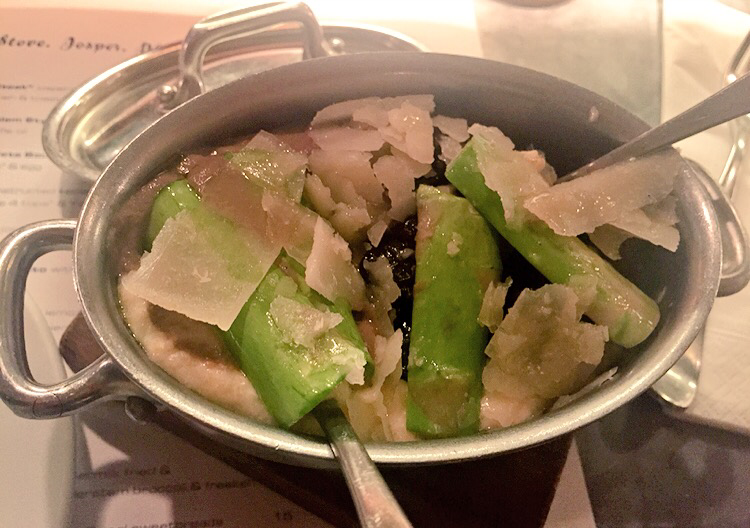 Tender spears of asparagus, parmesan shavings and a woody mushroom ragout add piquancy to the unbelievably smooth and creamy polenta mash, laced with an aromatic truffle oil. 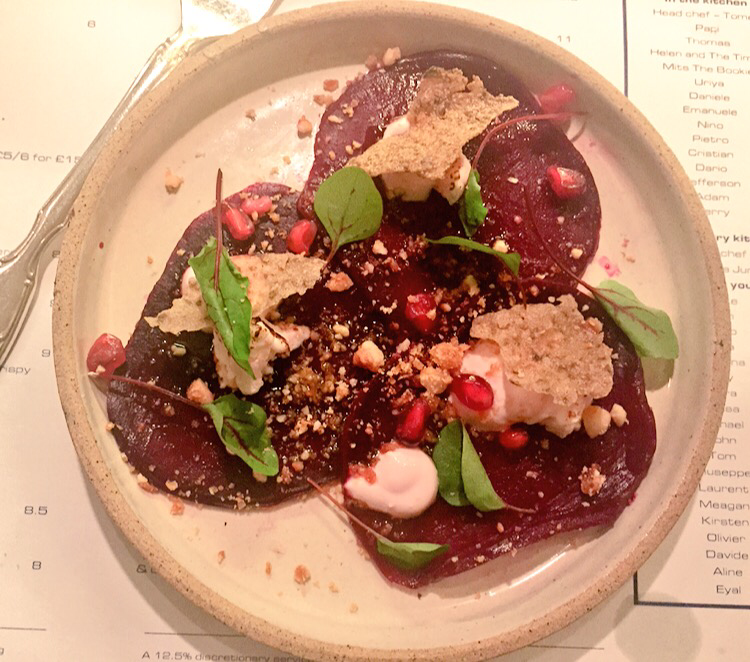 We were far too full to have been able to do justice to the dessert, but by the looks of it the Jerusalem Mess – a more exotic play on the English classic – is one to make a trip back for. And to see my new friends of course. 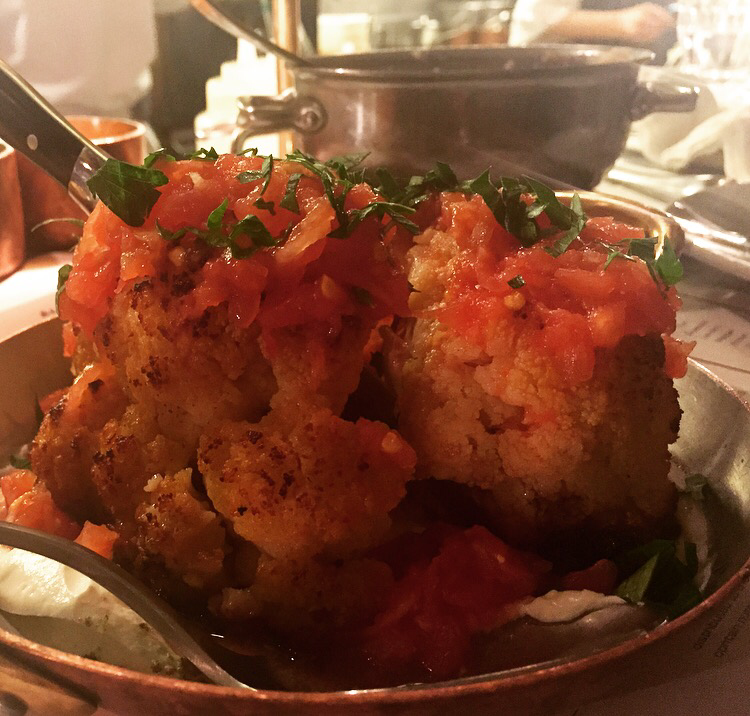 I had a friend come stay with us this week and she was raving about The Palomar – particularly the cauliflower steak! Between you and her, I’m absolutely convinced the boyfriend and I must pay it a visit soon! Oh you really must!! Everything is heavenly – really recommend the polenta too. And you’re guaranteed a spirited evening thanks to he incredibly friendly kitchen staff just behind the counter!